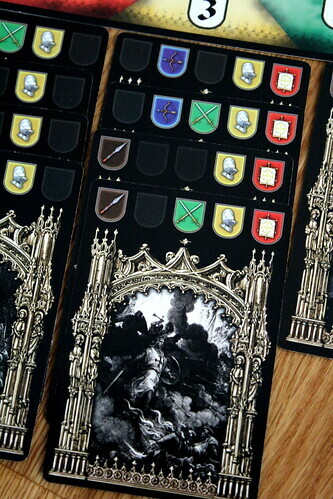 Our review copy of The Kingdoms of Crusaders was supplied by RightGames. Thanks a lot! I’m not sure if I would follow the rulebook of The Kingdoms of Crusaders in considering the Crusades one of the most romantic periods of European history. It was a bloody period of warfare involving the civilian population led by what would be considered religious extremists today. Come to think of it, those two things are confused a lot, that’s not surprising. A lot more surprising is that The Kingdoms of Crusaders is not a wargame, not even close to it. 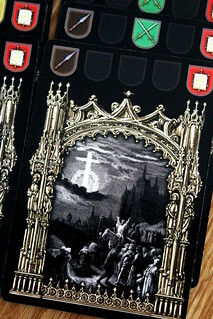 The Kingdoms of Crusaders is a majority card game for two players – or up to four with two copies of the game. We’re still setting out to conquer the Holy Land, though: a Holy Land consisting of five regions labelled in Cyrillic, but since they’re only zones on a paper strip, their names don’t matter much. The armies you send to conquer are printed along the top of the cards you play and come in five types: untrained fighters, bowmen, trained soldiers, knights and leaders (from weakest to strongest). Each card has from one of these symbols up to all five of them, in any combination. On your turn, you draw a card, then you play card into one of the five regions. Each region takes four cards from each player, so the game lasts only 20 turns. Then the winner for each region is determined. To find the winner of each region, you go down a short list of conditions. At first, you count the number of Regiments, that is four identical symbols in a region. If one player has more Regiments, he wins the region. If both players have the same number, the one with the most powerful Regiment type wins. If that is also the same, or both players have no Regiments, you go on to compare Battalions, that is three of the same symbols. Again, you compare number first, in case you’re still tied compare power. If that still doesn’t bring a decision, you go on to compare Companies – two of the same – and finally the most powerful single symbol. In the very rare case that you’re still tied, victory goes to the player who first played the fourth card in the region. Unfortunately, you don’t mark who finished first, so if you ever get down to this rule, especially in a four player game, prepare for some heated debate and possible loss of friends. Or you are prepared for that contingency and use the victory point markers, conveniently labelled with I, II and III, to mark who finished in what place, avoid the argument and be admired by all your friends. All that because you were prepared and read the review. In a two player game, you won’t be needing the victory point marker anyway, each region is worth one point to the winner. In a four player game, the second and third place in a region still get points and can theoretically win the game without coming first in any region. If you’re lucky and clever enough, that is, because you need both in The Kingdoms of Crusaders. Luck is pretty obvious, you draw cards with very different power levels, and in some games one player’s play area looks like a Florida Christmas Tree (without the blinking) while the others’ more closely resemble central Australia on a satellite photo. It’s less obvious why you need strategy in a rather simple game like this, but with card luck being approximately equal, playing smart wins the game. You have to recognize where you have a chance to win with the cards to have, where you won’t win no matter what you do so you can dump cards. We’re not talking Chess or Go here, but for a card game that plays in ten minutes the thinking required is appropriate. In two, The Kingdoms of Crusaders is a good way to kill ten minutes – or maybe thirty or forty, because why play only once?- that takes one central mechanism – area majorities – and builds a game around that and only that. We didn’t actually try in three or four players for lack of a second game, but likely you’ll need a bit more thinking and a bit less luck because now you have to keep an eye on more opponents, you have more chances to score because second place still gets you points – it’s actually a pity we couldn’t try, because I think that 4 players could be where the game gets really interesting.